Joint Turkish-U.S. patrols in northern Syria's Manbij district could begin Tuesday or Wednesday, Defense Minister Hulusi Akar said. "The training process has been completed. The joint patrols are expected to start [either] today [or] tomorrow," Akar said Tuesday. According to the minister, Turkey's next area of activity after Manbij will be terror targets east of Euphrates River. Speaking at the parliament earlier Tuesday, President Recep Tayyip Erdoğan said Turkey will soon launch a large scale anti-terror operation east of Euphrates. A Pentagon spokesman also said on Monday that Turkish and American troops have finalized their training and preparations for joint patrols in Manbij. "Mission rehearsals and interoperability training for combined patrols outside Manbij city are complete," Cmdr. Sean Robertson said, adding that, "Both forces are resetting in order to begin combined patrols." "The mission rehearsals address safety and familiarization with combined tactical operations," he said. 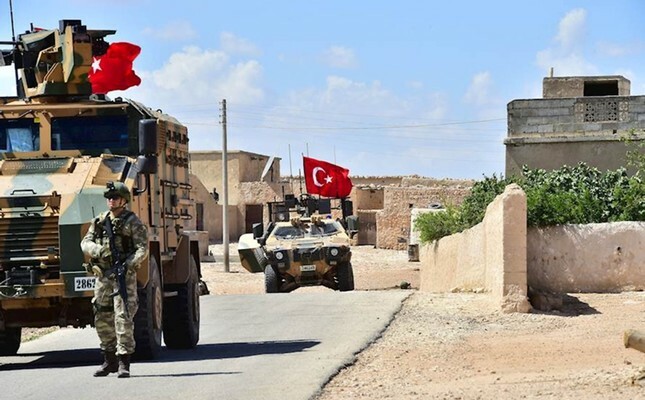 As agreed by the two NATO allies in June, Turkish and U.S. forces are currently carrying out patrols in Manbij, but those are independent of each other. Creating joint patrols is seen as a way to tamp down potential violence between the various groups in the area. The Manbij patrols are part of a "road map" that Ankara and Washington agreed on in June to defuse tensions amid demands for the withdrawal of the U.S.-backed People's Protection Units (YPG) terrorists. The Manbij deal focuses on the withdrawal of the PKK's Syrian offshoot, the YPG terrorist organization, from the district that is located west of the Euphrates river in order to establish stability in the region. Ankara has long been voicing that it will not allow a terror corridor along its borders and asking for an acceleration in the implementation of the Manbij deal with the U.S.
Turkish troops and their allies the Free Syrian Army (FSA) captured the bordering Jarablous, al-Rai and al-Bab districts from the Daesh terrorist group through Operation Euphrates Shield launched in August 2016. While Daesh terrorists retreated, the YPG advanced on Manbij through a bridgehead and captured the town. Manbij has been a major sticking point in the strained relations between the U.S. and Turkey. Ankara considers the Democratic Union Party (PYD)'s armed wing, the U.S.-backed YPG, a terror group that is linked to the PKK — an internationally-recognized terror organization. Turkey considers the YPG a grave threat to its national security since it is a part of the PKK, which is listed as a terrorist organization by the U.S., the EU and NATO. The PKK has been fighting the Turkish state for the last 40 years in a conflict that has claimed more than 40,000 lives. The YPG's and PKK's ultimate aim is to establish an autonomous region in parts of Turkey, Syria, Iraq and Iran. The group currently controls almost all the territory east of the Euphrates, comprising nearly one-third of the territory of Syria, except for the Assad regime-controlled area near Deir ez-Zor and the Daesh-held area near the Iraqi border.